One day closer to our monthly shopping trip and we dined on a wonderful pantry-based dinner. This dish is a variation of one of our all-time favorites – Cheesy Pasta Casserole. I originally intended to do a standard baked mostacolli, but them I realized I was out of ricotta and running low on mozzarella. 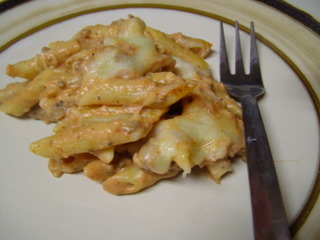 So I decided to improvise and combine the cheesy pasta casserole ingredients with a basic mostacolli method. It turned out great. The texture was rich and creamy with the ground beef providing a nice counter balance. And the whole thing was just full of cheesy, saucy flavor. I think this might become my preferred method for this dish, replacing both regulars. 1. Cook noodles according to package directions. Drain, return to pot and add cream cheese and sour cream. Stir until cream cheese is melted. Add tomato sauce, ground beef, seasonings and 1/2 c. shredded mozzarella. Stir to combine and transfer to a casserole dish. 2. Cover pasta mixture with remaining shredded cheese. Bake at 350 degrees for 15-20 minutes, until bubbly and cheese is melted. We started our day with either homemade waffles from the freezer or leftover banana bread. For lunch, the two oldest picked up lunch at school and the rest of ate leftovers and oranges. I know I said I’d start getting into our grocery budget today, but…well, sometimes life happens and I just don’t have the time today. I will say that our budget is $450 per month for the 6 of us, although I try to come in lower than that most months. This is quite a large increase from our budget just over 6 months ago, so I’ll explain why we had to up it tomorrow. Until then, I’d love to know how you decide on a grocery budget and what, if anything, means you need to lower or increase your budget. This looks delish! Thanks so much for sharing…I love reading your blog! I just wanted to check…when you say manicotti noodles, do you mean penne? I always think of manicotti as the big stuff-able pasta rolls…but this looks perfect using penne! Oops! Thanks Tanya. I meant mostacolli, not manicotti. At least I was consistent in my mistake throughout the post. 🙂 I fixed it now! And yes, mostacolli noodles and penne noodles are virtually the same thing. One has ridges and one doesn’t, although I don’t remember which is which right now. Love this idea. I need as much help as I can get on our budget lately. We recently moved to a new area and have increased our food budget by double. This month I am “cutting” it down to $600 for a family of 5! We are living in a very expensive area and I am still not set on our routine. Hopefully I can get it back down to $400. Our food budget for two of us (and one bun in the oven) is $300/month. We actually just increased this after making the decision to commit to buying more local foods as well as local, free-range/grass-fed meat, chicken, eggs and milk. I know I could feed our family for less (and will, if at any point the budget cannot support this monthly amount), but buying healthy food (locally, as much as possible) is very important to us. We see it as an investment in our and our family’s future health. Looks so yummy! I love your site! We have a family of 6 (4 kids ages 11, 9, 8 and 6yrs.). I plan a grocery/household (toilet paper/shampoo, etc.) budget of $500 a month. The only time I go over is if there is a lot of meat on sale the same month and I stock up. That used to seem impossible before coupons and stocking up when items are on sale. I told my husband we used to have a $500 budget but never met it. I would spend that on the main groceries but then make additional trips for things I forgot. That looks yummy! Do you think it would freeze well? This looks yummy…I might give it a try just to break up our normal spaghetti routine. Oh and budget…I started couponing about 6 months ago and that has cut our budget. I might spend more in single trips but because we have a bit of a stock pile I don’t have to shop as often. We have a family of 4 and I try to keep it around $300. Assuming I don’t send my husband to the store I can usually stick to that. In the summer we change how we shop but probably spend about the same. I go to the traditional grocery store less often. We go to a farmers market (not significantly cheaper just fresher) each week to buy produce and Sam’s Club every month or 6 weeks for proteins and just fill in some staples and milk from the regular grocery store. Grocery money is whatever is left after the bills are paid! I usually have $450 a month for the 5 of us. That includes household products and dog food. My husbands pay checks vary ALOT (he’s an automotive painter) so we can get by on much less….but that’s only because the freezer is stocked. Our 18month old son was also just put on a pretty pricey organic form of pediasure….so i need to work that in too. I’m going to try this for Friday but ommitting the meat…we do meatless on Fridays during Lent :). Our grocery budget for our family of ten is $800. This includes everything from formula and diapers for our twin boys to care packages for our oldest in college! Wish we could get in lower! Love your blog and your recipes are great! I budget about $260/month ($60 per week) for our family of 3. Although, I RARELY spend this much it allows plenty of room in the budget for me to stock up on sale priced meats, etc. My husband and I really enjoy cooking, so our budget also supports the meals that we cook that aren’t at all budget friendly. This was great! I made it tonight and didn’t have sour cream so I used yogurt and it turned out delish – thanks so much! I have a particular grocery store in my area that sometimes greatly discounts meats on Saturday mornings. If I happen to visit during those times, I’m willing to up the budget to get those meats at such huge savings. It’s not uncommon for me to save $100 just in meat. If I’m not already planning some freezer cooking I’ll think up some impromptu meals that I can easily assemble to get the meat cooked and in the freezer. I’m also willing to pay more for fresh, local produce in the summer. To cut back the budget, I’ll forego a big shopping trip if I have a well-stocked freezer and the sales aren’t great that week. For instance, today I only got a little produce, milk, and staples because I didn’t think the sales were all that grand. To the commenter who said she’s willing to pay more to get healthy foods, I 100% agree. I really try to provide us with healthy foods, maybe not organic or specialty, but as healthy as I can afford. We rarely ever get sick. I truly believe it’s partly because of our diet. YUM! 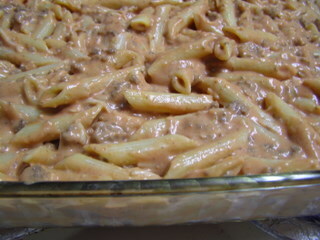 I love baked pastas and adding the “cream” party looks delish. Our budget for groceries and household items is $240/mo for 4 of us (kids are 3 and 1 and the 1 yr old eats more than his older sister!). I use cloth diapers the majority of the time so that cuts out a lot of diaper expense! I feel like our budget is high, but we eat as much organic/natural and local as we can. I am part of some co-ops for beef, produce and other items, which saves money. Our budget is $300/month. We have three boys, 7, 4, and almost 3. That doesn’t include things like TP, diaper wipes, etc. I know some people include that in their food budget, but that just confuses me! 🙂 We eat a lot of fresh fruits and veggies, some organic, meat most dinners. I just try to shop very carefully and make most things from scratch. Our budget has gone up a lot in the last year or two, probably partly because of our growing family and partly just higher prices. To help save $$ on groceries, every January, we purchase 1/2 beef from my husband’s co-worker. We usually get around 350 lbs. It costs us about $700, but averages out to be $1.40/lb (with processing fees); which averages out to $58 a month! When I go to the store and see a T-Bone steak at $6.75/lb or a Chuck Roast loaded with fat for over $3.00/lb, it makes me very happy that we do this every year!! This summer, to help cut down costs even more, I plan to plant my first garden, and teach myself how to can and freeze the produce from the garden. I’m really excited about it! Another way we have cut down food costs is to cut down on how often we eat out! When we actually took a look at what we were spending by going out to eat, it was a pretty simple decision to stop going out as often. Now we go out twice a month, and call it our Date Night! For the two of us, we usually average $225 a month for groceries.